The Cardinal reminded that, in the beginning of the 90’s, the Bishops concluded in Zadar that, on the basis of their investigations, they cannot speak about the supernaturality of Medjugorje, but neither have they denied it. Mons. Bernardo Witte, Oblate of the Immaculate Virgin Mary, retired bishop of Conception (Argentina), spent the Holy Week in Medjugorje. He came on pilgrimage with a group from Germany, because he is a German himself. He was presiding the morning Mass for German speaking pilgrims, he was praying and hearing confessions. “As Bishops, we go all five years to the Ad Limina visit to the Holy Father. In 1984, after my stay in Rome, I went to Vienna to visit a friend of mine, a priest. He spoke to me about Medjugorje and I believed at once. Since then, I have the desire to come to Medjugorje. Now, as I am retired, I have more time then before, so I came to spend the Holy Week in Medjugorje. I want to see, to know, to pray. I have heard the key words: prayer, penance, conversion. Fr. Mathuni, who spoke to me about Medjugorje, was present during one apparition. He saw the sincerity of the children and the intensity of prayer of those who were present. Since then, I keep an eye on the events of Medjugorje, and in past 20 years, I have been convinced that they are true. They convey a message of faith and a message of hope, which the Church is conveying, while calling to prayer, to fasting and to conversion. (about fasting) This intensity is rather surprising, but this is how I interpret it: morality and ethics in the world are in great danger. In an extreme danger for the world, for the Church and for souls, extreme measures are needed. (about the fact that the visionaries of Medjugorje are all married) I would say that this underlines sacredness of human marriage, sacredness of reproduction and sacredness of sexuality. Today’s civilization of death leads to death, and the events of Medjugorje point towards a civilization of life and of love. I would say that renewal of family life and renewal of the parish – and of its pastoral strength – go together. Here, we do not only have the impression of a living Church, but we make the experience of it. This is a fact. (about the fact that the apparitions happen on a daily basis and that there have been thousands of them) I admire and I rejoice! Each apparition is a new hope and a new challenge. Also to this question, I have the same answer: in a great danger of the civilization of death, these apparitions promote a civilization of life. I have the impression that everything is happening in a harmonious way: these apparitions, the pontificate of John-Paul II who encourages the renewal of the pastoral life in the Church, and many bishops who consciously give a Marian orientation to their episcopate… To resume, I would repeat the words of Our Lady in Fatima: “At the end, my Immaculate Heart shall triumph!” I think that both, the apparitions of Fatima and of Medjugorje, signify a call to the renewal of Europe. In Medjugorje, the communist East has begun to collapse. Medjugorje is a carrier of joy, of hope and of trust. Msgr. Bruno Tommasi, retired bishop of the diocese Lucca in Italy, came on pilgrimage to Medjugorje in June 2004. On June 19, he presided the pilgrims’ Mass for Italian speaking pilgrims. Msgr. Mauro Parmeggiani from Rome came on pilgrimage to Medjugorje during the Youth Festival 2004. Msgr. Parmeggiani believes in Our Lady’s presence in Medjugorje and speaks about “the beauty and the profundity of Our Lady’s message”. He is recommending us to do all that we can, so that “Medjugorje may preserve the simplicity, the austerity and the intensity of prayer, so that all may encounter Mary, and through her, her Son Jesus, who are inviting us to conversion and the essential Christian experience today”. In the diocese of Rome, Msgr. Parmeggiani is especially charged with the pastoral work with youth, and he is preparing the “First European Meeting of Eucharistic Adoration Youth Groups”, which will take place in Rome from October 6th to 10th, 2004. Mons. Parmeggiani, who was deeply impressed by the Youth Festival in Medjugorje, wishes as many young people as possible to participate at this encounter in Rome. Mons. Giovanni Moretti from Meina (Italy), a retired archbishop and apostolic nuncio, came on a private pilgrimage to Medjugorje in the beginning of October 2004. Mons. Moretti participated in the evening prayer program and was available to the pilgrims for the sacrament of Holy confession. He said that he was enthusiastic about devotion and the spirit of prayer that reign at the Shrine. On Sunday, October 3, he presided Holy Mass for Italian pilgrims. This interview was made by Marie Czernin for the German Catholic monthly magazine PUR. It was published in December 2004. - Marie Czernin: Bishop Hnilica, you spent much time with the Pope John Paul II and you had many private encounters with him – for example when you visited him at the Gemelli Hospital shortly after the attempt on his life, May 13, 1981. Did you ever speak with the Pope about the events in Medjugorje? Bishop Pavel Hnilica (B.P.H.) – I visited the Holy Father on 1984. We had lunch at Castel Gandolfo, his summer residence, and I told him about the Consecration of Russia to the Immaculate Heart of Mary, which I have done in the muscovite Cathedral of the Assumption, on March 24 that same year, according to what Our Lady had asked in Fatima. When I told to the Holy Father about these events, he was very touched and he said: “The Virgin Mary led you there under her protection”. I responded: “No, Holy Father, she was carrying me in her arms!” After this, he asked me what I am thinking about Medjugorje and if I have visited that place. I answered that the official Vatican has not forbidden me to go, but that I was counselled not to do it. The Pope looked at me and said: “Go to Medjugorje incognito as you went to Moscow. Who can forbid you this?” The Pope has not given me an official authority to go there, but he found another solution. The pope continued to speak, and he showed me a book about Medjugorje written by René Laurentin. He started to read some chapters and he underlined that the messages of Medjugorje are in close relationship with those of Fatima. “Look, Medjugorje is a continuation, an extension of Fatima. Our Lady is appearing in communist countries primarily because of problems that originate in Russia”, said the Pope, who already took this as a mission of his pontificate. This is why I immediately understood the connection. B.P.H. – Some years ago, there was a Youth meeting in Marienfried, and I was invited. During the encounter, a journalist asked me: “Bishop, don’t you believe that, all that is happening in Medjugorje, comes from the devil (Satan)? I answered: “I am a Jesuit. Saint Ignatius taught us how to discern spirits, but he also taught us that each event can have 3 different sources: human, divine or diabolic.” At the end, he agreed with me that what is happening in Medjugorje cannot be explained from a human point of view – the fact that every year normal young people – thousands of them – are attracted, they stream in order to reconcile with God. 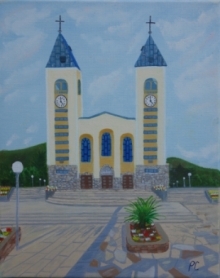 Medjugorje has already been named “confessional of the world”, because, as a phenomenon, neither Lourdes nor Fatima managed to spur that many crowds of people to go for confession. What is happening during confession? The priest is delivering the sinner from the devil. Then I answered to the journalist: “Off course, Satan is capable of many things, but he is not capable of one thing: Is it possible that Satan spurs people to go for confession in order to be delivered precisely from him?” The journalists laughed, understanding what I wanted to say. Therefore, the only cause remains in God. Later on, I told to the Holy Father about this conversation. B.P.H. – In all three places, Our Lady is inviting us to repentance, forgiveness and prayer. In this aspect of the message, these three apparitions are similar. However, the difference in Medjugorje is that the apparitions are lasting for 23 years now. The intensity of the continuation of the supernatural is neither declining nor diminishing during all these years, and the result is an even greater number of intellectuals that are converted here.